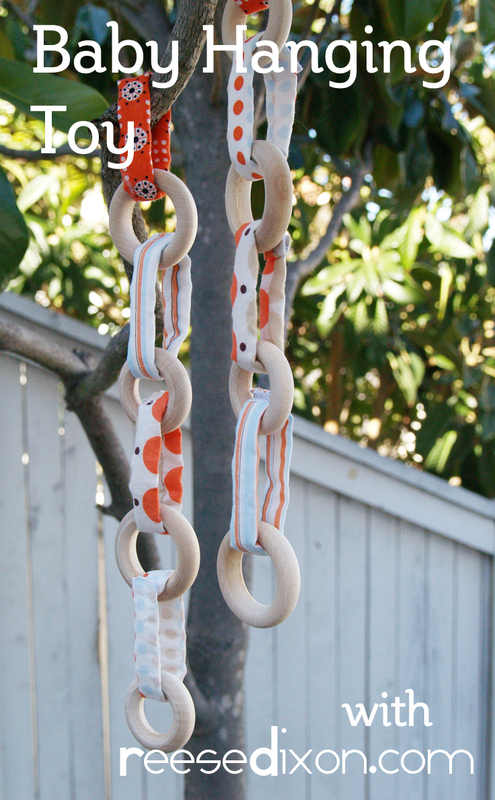 This hanging toy is made up of all natural materials, so if you have a chewer like I do, you can rest easy. Back to business around here, it’s time I share this little project in detail. If you’re much of a sewer it’s probably instinctual, but if you’ve been meaning to pick it up here’s how. This project really couldn’t be much simpler, and it’s a super easy first project. Cut four strips of fabric 1 1/2″ x 6″, sew into a tube using a 1/4″ seam allowance, and turn right side out. Thread a piece of batting through the tube. I cut mine about 1/2″ x 7″ and then rolled it up. Trim the batting, fold the raw fabric edges in, and sew a small square of velcro to each end. If this part is a too fiddly for you, you can use a fabric glue. Alternate a fabric ring with a wooden ring, and then dangle over baby’s head. I got my wood rings here, and I used a couple of different sizes. They make absolutely fantastic teethers, they’re easy to hang onto and Atti hasn’t managed to gag himself with it yet. He’s is already too strong for the type of velcro I used, so you might want to take that into account when you’re standing in the aisle at the fabric store. I’m working hard on preparing some things to go up for sale in my shop, and since I still have some wood rings leftover, there may be one or two of these up for grabs.